ROLLING MEADOWS, Ill., March 8, 2011 (GLOBE NEWSWIRE) -- Northrop Grumman Corporation (NYSE:NOC), in partnership with the Air National Guard's 190th Air Refueling Wing (ARW), today announced the completion of the first round of flight testing with the company's Guardian™ System anti-missile technology onboard a KC-135 air refueling aircraft. "To date we have conducted airworthiness flight tests and several air refueling test sorties. The feedback from the flight test pilots has been overwhelmingly positive," said Col. Keith Lang, commander of the 190th ARW based at Forbes Field Air National Guard Base, Topeka, Kan. "We are pleased at the partnership established with Northrop Grumman and remain encouraged that the attributes of the Guardian™ System will prove a viable option for providing aircraft protection without disruption to KC-135 missions. The KC-135 has flown in harm's way since Vietnam and the time is right to add this extremely important defense capability." The 190th ARW is home to nearly 1,000 airmen at Forbes Field. The 190th is a Air National Guard Wing assigned to the Air Force Air Mobility Command and flies the KC-135 air refueling aircraft in support of worldwide aerial refueling missions. The 190th also has a state mission that includes emergency relief support during natural disasters, search and rescue operations, and support to civil defense authorities. 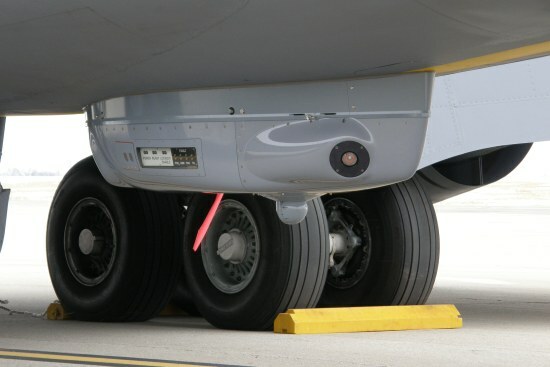 An up-close view of Northrop Grumman's Guardian(TM) pod installed on an Air National Guard 190th Air Refueling Wing KC-135 aircraft.